If you have any questions, concerns, or comments regarding Dr. Chaula Patel, please fill out the short contact form below. Chaula Patel, MD opened her medical practice in Bronx, New York with the goal of providing compassionate care that considers her patients’ physical, emotional, and spiritual wellbeing. Over the last two decades, she has proudly exceeded her goal, offering comprehensive primary care and internal medicine services that integrate conventional, alternative, and complementary therapies to prevent disease and promote optimal health. Dr. Patel treats the diverse range of health concerns faced by adults, from preventive care and weight loss to chronic diseases such as diabetes, arthritis, hypertension, and fibromyalgia. Her patients can also receive body contouring with Cynosure’s SculpSure® treatment, a safe laser treatment that effectively eliminates fat. She’s especially proud that her practice has short wait times and sufficient staff to accommodate walk-ins and emergencies. 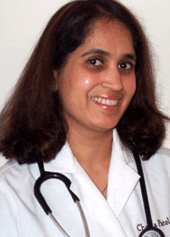 After earning her medical degree at South Gujarat University in India, Dr. Patel completed her internal medicine residency at St. Barnabas Hospital in New York. She’s board certified by the American Board of Internal Medicine and a member of the American College for Advancement in Medicine. Dr. Patel keeps her hand in education by teaching medical residents and physician assistant students. Dr. Patel is passionate about providing integrative health care focusing on all aspects of a patient’s life, including the impact of diet, exercise, and weight on overall health. Her belief in the benefit of a balanced life is easy to see as she devotes equal time and energy to her medical practice, traveling, reading, hiking, and spending time with her family. At Dr. Patel's office, we accept most major insurance plans. Here is a list of some of the plans we accept. Please contact our office if you do not see your insurance provider listed.